The weather is recovering and so am I. This week Istanbul and indeed western Turkey has been ravaged by severe winds followed by snow, sleet and now rain. On the personal front, I have had the worst cold of my life which kept me home for days. But still, I’ve survived …. You know you’re getting better when you actually feel like getting back into the kitchen again and so it was that I came to make gözleme! I put an exclamation mark because gözleme is something I never thought I would try. Gözleme is something that we associate closely with our village of Assos.Our next door neighbour makes it in her outdoor oven sometimes and makes extra for us. All the little eating places around offer it in the season. Indeed, their repertoire is fairly limited and this is usually a good choice. Basically it’s a pastry rolled very thinly and sprinkled with one of 3 rather predictable fillings: kıymalı/with ground beef or lamb, peynirli/ with cheese, or ıspanaklı/with spinach. The pastry is then folded like an envelope and browned in a pan or griddle. It’s ideal for let’s say, lunch, served with a glass of ayran, the yogurt-based drink, or as a rather nice snack with çay. I didn’t have any qualms about the pastry as regular pastry-making is something that holds no fears for me thanks to my mother insisting I learn how to make it when I was getting married! Let’s say I was curious and feeling bored after that enforced inactivity. The pastry is very different from say, shortcrust pastry but it works beautifully. I halved this recipe which made 12 in total – I thought 6 would do us! The dough is unlike anything I have ever come across: very wet, very sticky, very sloppy. You have to have confidence that you will ever be able to roll it. 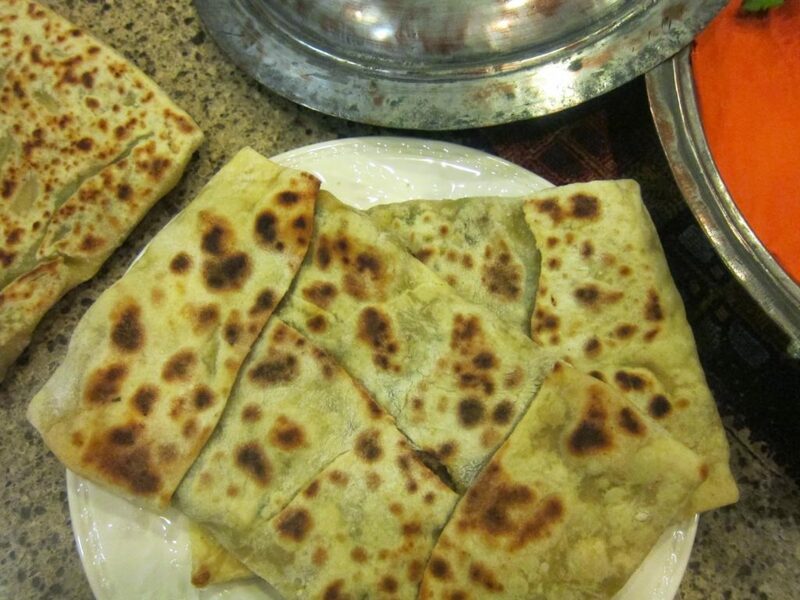 If you follow the directions to the T however, it works beautifully and the resulting gözleme will be very satisfying. I have to admit, I was really pleased with mine and TT was ecstatic! The only downside to this recipe is that it does take time: you have to knead and wait, knead and wait. Not difficult, just time-consuming. Heat the olive oil in a medium-sized frying pan and cook the onion and garlic for about 2 minutes until soft but not brown. Add the ground meat, paprika, cumin, flaked red pepper, and parsley. Season with the salt and pepper. Cook gently for about 5 minutes, stirring well to break up the meat. Remove from heat and leave to cool. Sift the flour into a large bowl. Make a well in the centre. Add the eggs, salt, butter, and water. Mix well. On a cool, heavily floured work surface, turn out the dough and knead it for about 2 more minutes, until smooth. 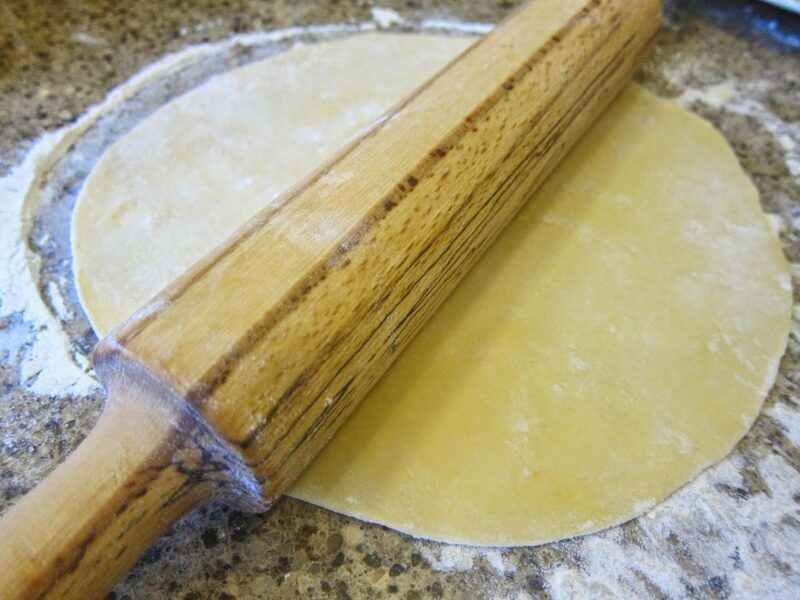 Shape the dough into a long cylinder and cut into 12 equal pieces with a sharp knife. On a lightly floured surface, gently shape each piece into a tight ball. 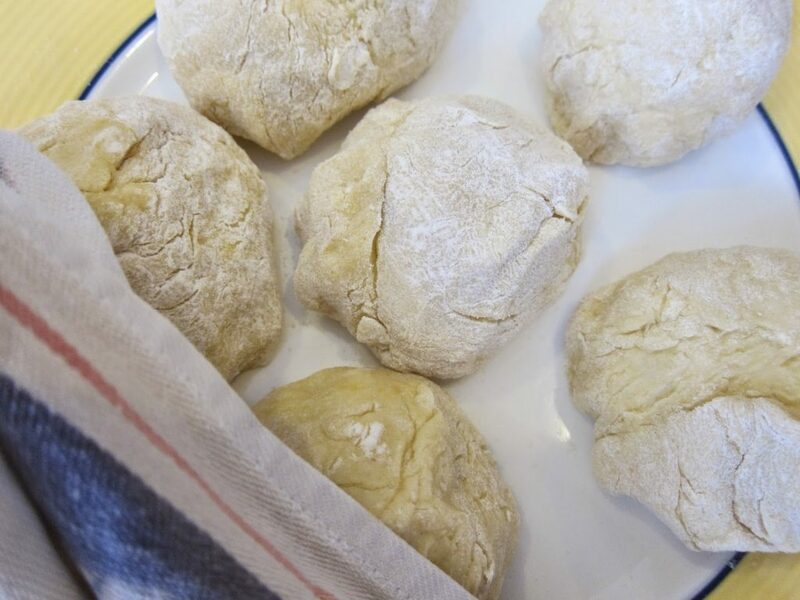 Cover the balls of dough with a damp cloth and let them rest for about 15 minutes. Knead each piece again for about 2 minutes, reshape it into a tight ball, cover it, and let the balls rest again for 15 minutes. Repeat this process one more time. 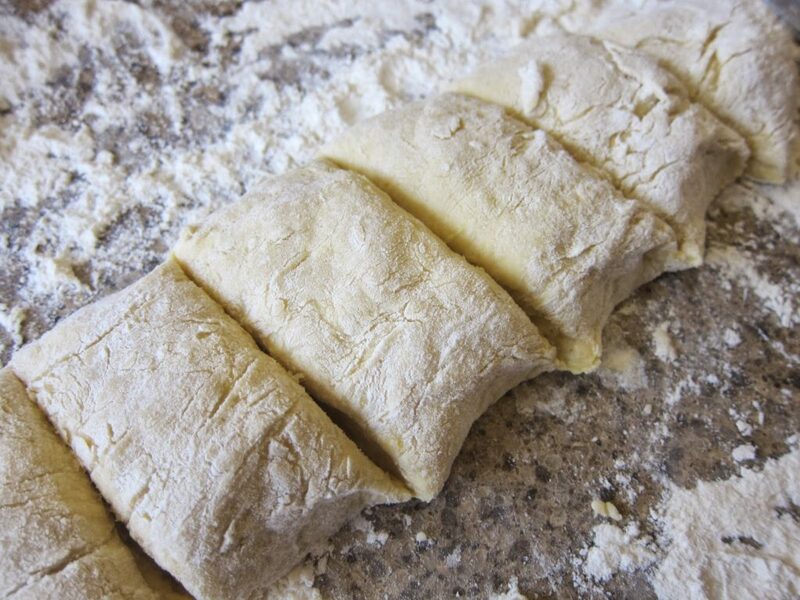 Sprinkle the balls of dough with flour and flatten each with the heel of your palm. Roll out each piece into a 12-inch/30 cm circle. Spread the filling on each circle. 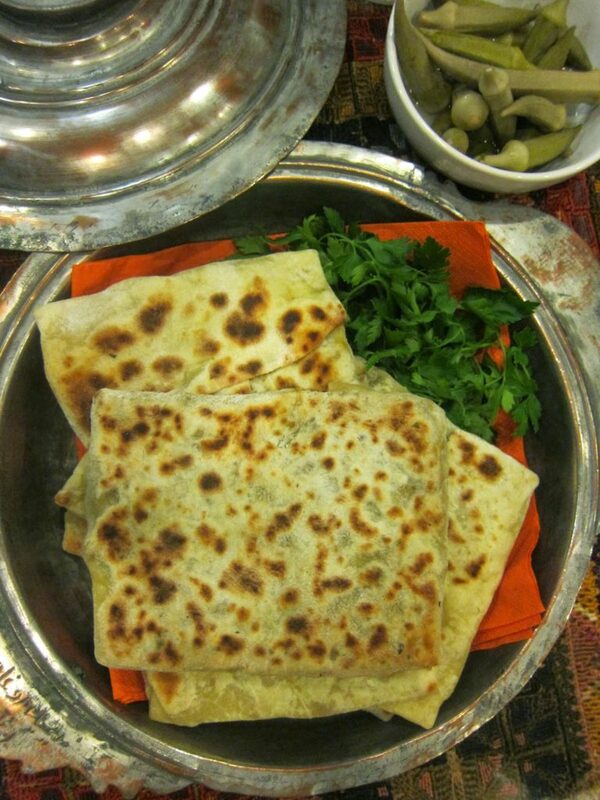 Fold over the dough like an envelope, about 6 inches/15 cm wide and 8 inches/20 cm long. Brush a griddle or large nonstick pan with butter and heat the pan. Cook the gözlemes one at a time for about 2 minutes, turning them once, until lightly browned. Brush the griddle lightly with butter each time before cooking. 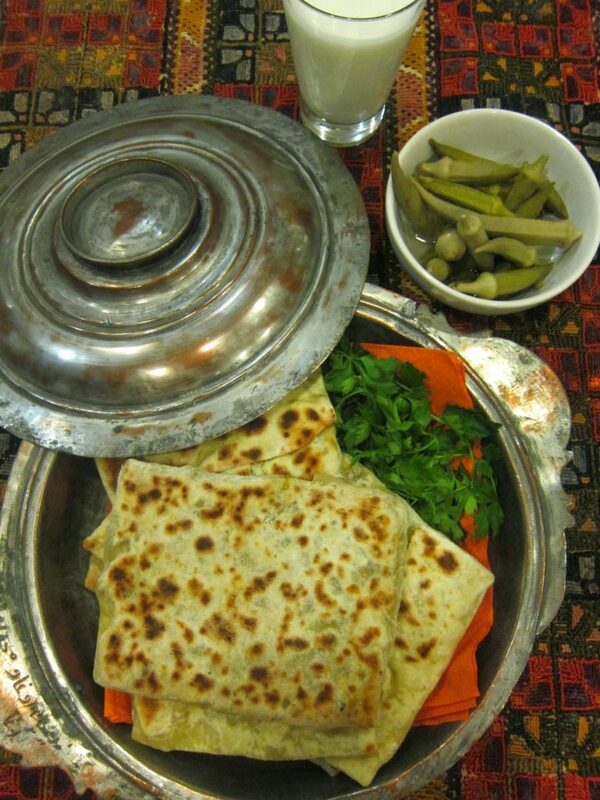 Serve hot or warm with ayran, plain yogurt, or çay.